Mix the powdered sugar and butter then add the peanut butter. It helps to refrigerate before dipping. 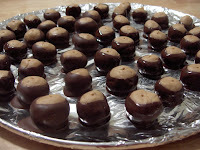 Roll out the balls and place them on a cookie sheet covered with parchment paper. Melt the chocolate in the microwave according to package directions. Dip the balls, using a toothpick, into the melted chocolate. Refrigerate or eat, whichever comes first.